One of the reasons, GMail is the most popular email program is the amazing world of plugins (apps) you can add to optimize your e-mail experience. In this session, Juanita will give you 7 of them you will absolutely love! Consumers of different generations are different which means you need to market differently to them. 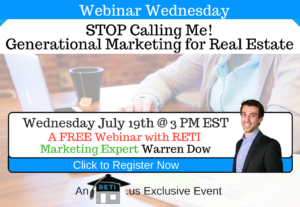 In this amazing FREE RETI webinar, Warren Dow will show you how to do it right! Click Here to Register for this Webinar Now! Just like you install apps to your phone to do cool things, you can install Add-ons into Google’s Office Suite to take your business to the next level. 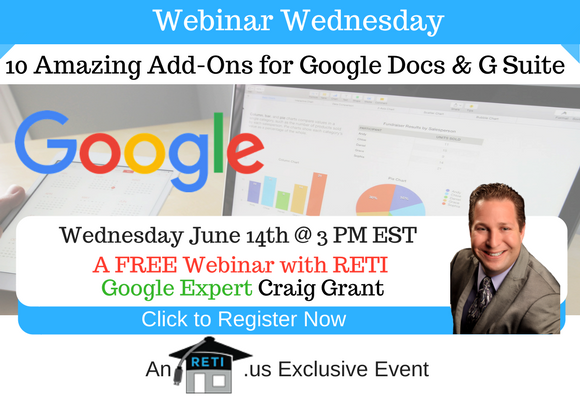 In this webinar RETI’s Craig Grant will show you these awesome tools!